Opinion Palooza: Was Yadi Right Or Wrong? Opinions on yesterday’s Yadi drama have been spreading like wildfire (thanks, social media) and very few of them are alike. Very few of them matter, either. So naturally, I’m going to add one more. The call was absurdly bad, and should be labeled as such. The TBS announcers agreed, saying the call was worthy of discipline from Major League Baseball. The umpire should have a “feel for the game” that helps with understanding player reactions. Bengie Molina, who was the acting first base coach yesterday made that very clear. Molina’s reputation should have come into play. “…these are the major leagues, not Little League. Ticket prices are high. Umpires shouldn’t eject elite players simply for tossing equipment. Molina was upset his would-be hit didn’t get through the infield. He was frustrated this opportunity to build another big inning against the Giants passed. A veteran umpire understands all that and shrugs off the incident. After all, Molina has built solid rapport with most of them while working behind the plate. In fairness, outside the Cardinals circle, the opinions are less in favor of Molina. The reaction was childish, they say, and the helmet slam alone was enough to justify the ejection. Can’t say I agree, but hey, that’s what opinions are all about, right? So, enough of the opinions you’ve already seen. Here’s mine. Keep in mind, I didn’t see the play live. In fact, I read all about it (including the plethora of opinions presented here) before ever seeing the play in full. With all of the story at my disposal, I formed my opinion. The call was, quite simply, bush league. A young umpire, a veteran player, a close game, a bang-bang call, a would-be turning point play erased … anyone in the league could have pulled the very same helmet slam, under the circumstance. Without even seeing the play, I said the odds were in Yadi’s favor, as far as the reason for the helmet slam. He’s a hard-nosed competitor. He knew he should have had a base hit, at least. The frustration was, in my mind, clearly with himself. After seeing the play, that’s even more obvious. If his problem had been with the umpire, he would have at least looked Fagan’s way once. Instead, he slammed the helmet, but turned and walked (rather calmly, mind you) towards the dugout. Say what you want about the appropriateness of big leaguers slamming and tossing equipment, but it happens all the time. Guys who general keep their cool get angry enough to throw things once in a while. Is it the most mature response? Maybe not. But it’s also not an unusual one. It’s also not one that generally warrants an immediate ejection, either. The umpire was out of line. Period. So was Yadi. Just like we expect umpires to understand veteran players, veteran players must also be conditioned to not lose control. Yadi lost control, in a bad way. Now, I’m still of the opinion, based on the way the eventual confrontation developed, that Mr. Fagan said something to Yadi. (And I’m not alone in this thought.) He had to instigate the explosion somehow, because even after he tossed Molina, Yadi turned back to Fagan with a look of complete confusion on his face, but still without going all crazy-eyed. He was looking for an explanation. THEN he went all crazy-eyed and that’s where the narrative changed. Yadi didn’t deserve the ejection. However, he crossed the line with his reaction to whatever Fagan did or didn’t say. I fully understand his anger. I get the outburst, even. Like Matheny said, you can’t take the passion out of these guys. 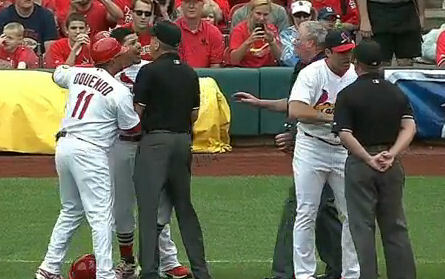 Still, Yadi has to know what a reaction like that could cost him and his team. Should he face a suspension (although that sounds less likely than some have suggested), the Cardinals would play without their leading man in a stretch where they’re going to need everyone playing at their best. While he was justified in being upset, he has have more self-control than that. P.S. – There was an actual baseball game that happened yesterday, too. David Freese homered. Tyler Lyons was good but not great. Randy Choate couldn’t hold on. The Cardinals lost. Clearly, that is the less significant story here. This entry was posted in 2013 Season and tagged Bengie Molina, Clint Fagan, Mike Matheny, San Francisco Giants, St. Louis Cardinals, Yadier Molina by Tara Wellman. Bookmark the permalink.